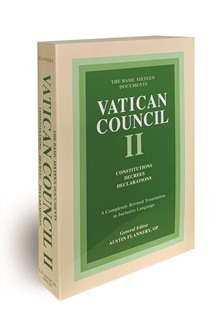 The sixteen official documents—constitutions, decrees, and declarations—of the Second Vatican Council are now available from Liturgical Press in the most popular and widely used inclusive-language edition translated by Irish Dominican Austin Flannery (+October 21, 2008). As the worldwide Church continues to celebrate the fiftieth anniversary of the Council (1962-65), there is a great need in college classrooms and parish faith formation groups—as well as for individuals—to again have access to these documents in contemporary English. As Flannery wrote in his introduction to the 1996 edition, "The translation of the texts of the Vatican documents in the present volume differs from that in the previous publication in two respects. It has been very considerably revised and, in place, corrected. It is also, to a very large extent, in inclusive language. "I say 'to a very large extent,' because we have used inclusive language in passages about men and women but not, however, in passages about God, except where the use of the masculine pronoun was easily avoidable." Much easier to read . . . to cite without sounding odd or quaint. There is a new fluency here. The virtually definitive version for the normal bookshelf. . . . By finding an inclusive speech-form, Fr Flannery removes any possible misconception regarding what the Council had in mind.